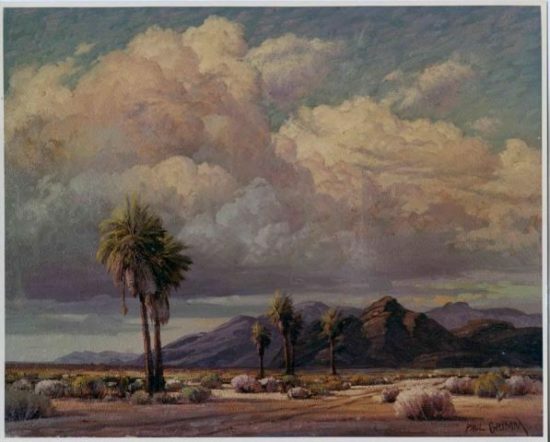 From the 1930s through the 1970s, Paul Grimm’s paintings broadcast a sublime vision of the Palm Springs landscape to tourists from around the world. 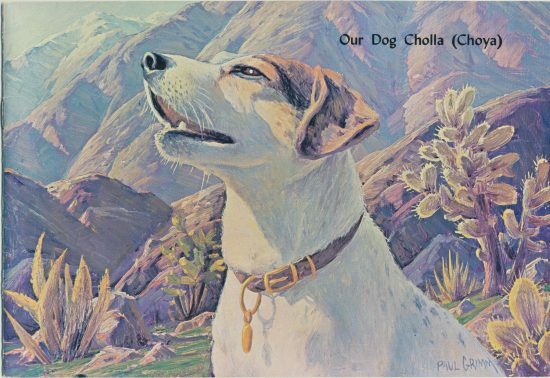 Yet for all of his importance to desert art, I’ve never known more about him than the standard mini-bio: He painted movie backdrops, ran a gallery downtown, loved his fox terrier named Cholla. 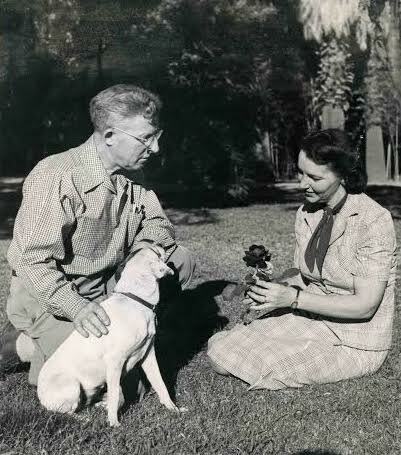 Paul Grimm with Cholla and Tillie. All images courtesy of Ann Tompkins. Because he left few personal records and had no offspring to tell his story, it seemed we’d never know more. Grimm would forever remain an encyclopedia entry. That changed recently when Harbor City resident Ann Tompkins sent her grandson into her attic to sort through 60 boxes of mementos stored there. 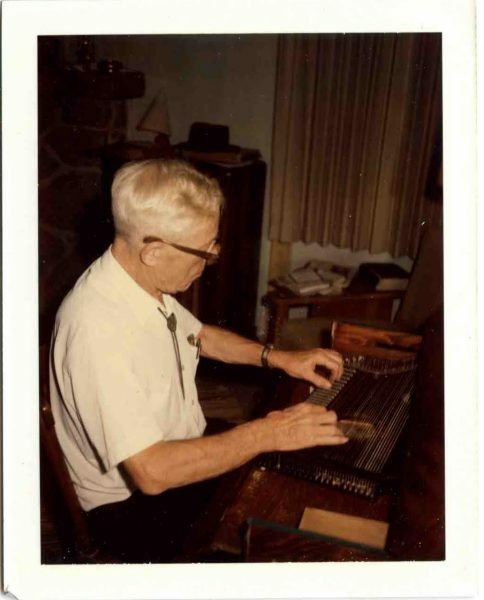 In the 58th box–in the farthest corner of the attic–the grandson, Nicholas, found a rare stash of more than 900 letters and cards Paul Grimm sent to Ann’s parents, Marie and Roy Hubbell. Tompkins’ collection includes rare photos of Paul Grimm at home. You can read a selection from those letters below. 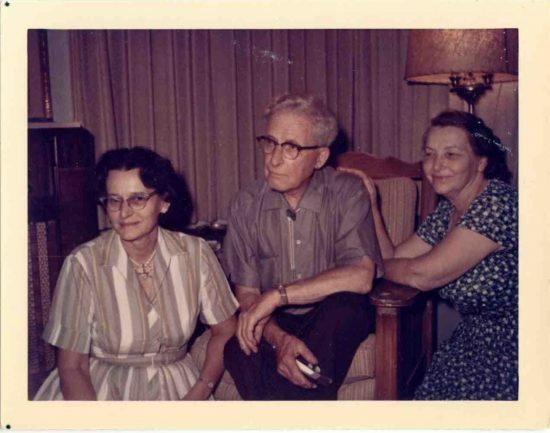 Ann Tompkins’ parents, Roy and Marie Hubbell, met the Grimms via their neighbor in the Temple City/El Monte area. The neighbor was Don Admiral, an early Palm Springs naturalist and founder of the original Palm Springs Desert Museum (now the Palm Springs Art Museum.) 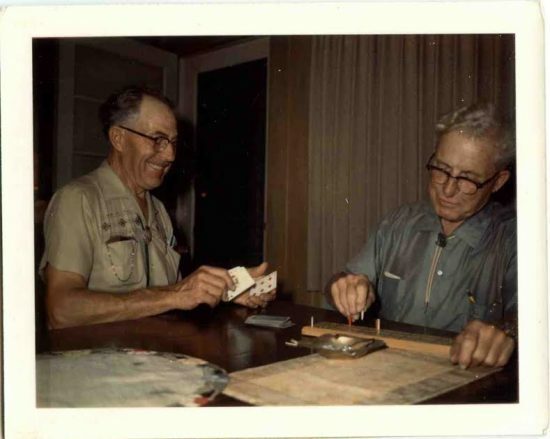 Roy Hubbell also liked to paint, but more than art what bonded him and Paul Grimm was their shared devotion to the game of cribbage. The Hubbells often visited the Grimms at their home at 526 Calle Palo Fierro, Palm Springs. 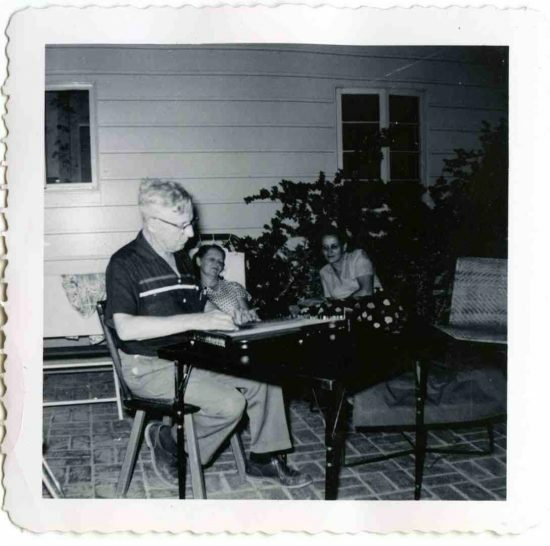 Ann–who was in high school at the time–remembered that Grimm played the zither and smoked cigars. He later made toy animals for Ann’s kids out of a handkerchief and complimented the early drawing efforts of her daughter, Fern. The Grimms were unable to have children of their own and so lavished attention on the Hubbell kids. The first letter, dated 1952, was addressed to Mr. and Mrs. Hubbell; but that quickly became: Dear Folks. 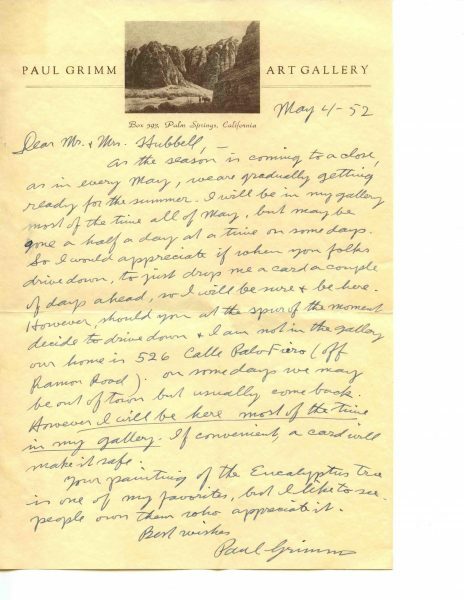 The Grimms sent letters from Banning and Beaumont (where they escaped the Palm Springs heat) and Santa Barbara–where they often stayed with the photographer Karl Obert. Other letters were postmarked Big Pine. 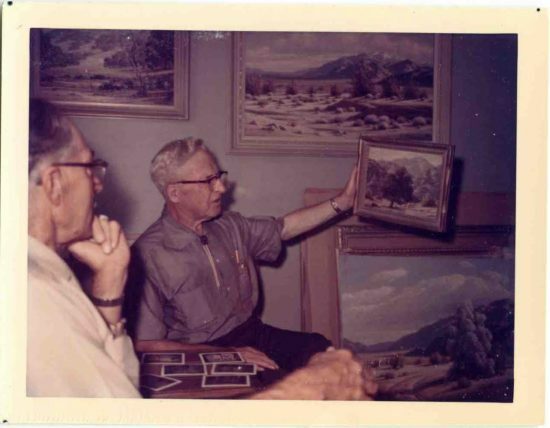 Paul Grimm painted many eastern Sierra landscapes. The couple used their cabin near Glacier Lodge as a base camp, backpacking to the higher lakes. 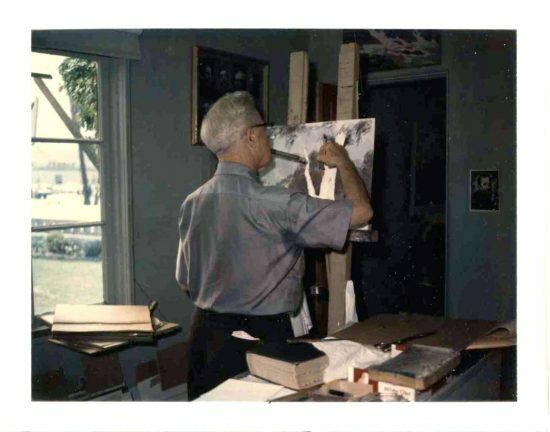 Over the years of their friendship, the Hubbells purchased a number of Grimm’s paintings and Grimm frequently shared his feelings on art and artists. He refers to a budding art student–Dwight Eisenhower–who visited the artist at his Palm Springs studio. 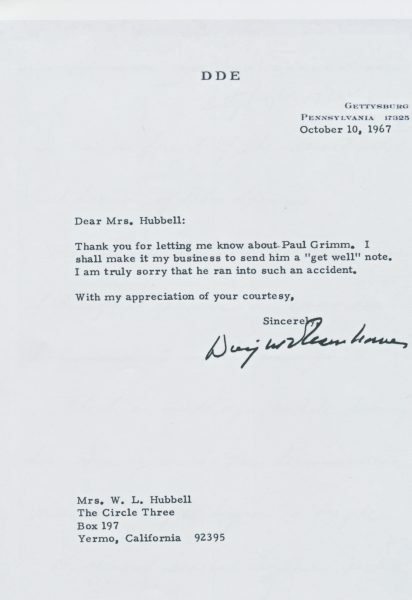 Among the letters Ann unearthed is one from “DDE” (Dwight David Eisenhower), thanking Marie Hubbell for letting him know about serious injuries Grimm suffered when he was hit by a bicyclist in Palm Springs. Like Grimm, Eisenhower felt modern art was “morally wrong” (according to art historian Sister Wendy Beckett) and–also like Grimm–he aspired to excellence and named Michelangelo and Leonardo da Vinci among his idols. While many Palm Springs galleries came and went, Paul Grimm thrived downtown for nearly 40 years, exposing thousands of visitors to his romantic view of the desert. The paintings were so ubiquitous, they began to define the public image of Palm Springs. Grimm paintings hung over fireplaces in Minnesota and Nebraska, reminding the owners of holidays in a warmer place. He was known for his portraits of Cahuilla Indians (few painters tackled the subject), including shaman Pedro Chino and Chief Francisco Patencio. But most of his output was dunes and mountains. All the lofty terms apply: Grandeur, nobility, majesty. The terms are out-of-fashion in modernist-mad Palm Springs–but the qualities remain stubbornly embedded in the landscape. Critics say Grimm’s early paintings from the 1930s were his best, ranking with the top California painters. (In 2016, his early painting of Mt. San Jacinto sold for $50,000 at a Bonham’s auction.) As the decades went Grimm he churned out more and more paintings to please tourists who visited his shop, and the results were sometimes tinny. 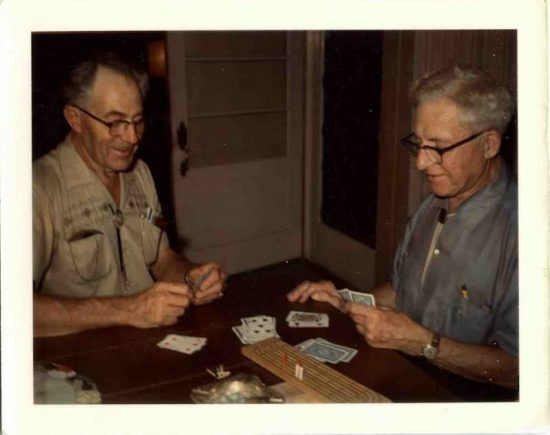 Paul Grimm’s cribbage pal, Roy Hubbell, died in 1969. Grimm told Marie that he hadn’t felt such a loss since his brother died 50 years before. We know from Ann Tompkins that Thekla “Tillie” Grimm withdrew socially after Paul died in 1974, and possibly never recovered from her husband’s death. The last letter in Ann’s collection is from the Riverside County Public Administrator, informing the family that Tillie Grimm had passed away on July 14, 1989. There were no heirs, and it’s likely some personal papers were discarded. The Irvine Museum received a box of Grimm papers from the estate, but they have not as yet been indexed. So for now the Tompkins letters are one of the only sources of background on the artist. “Paul Grimm really wanted to be remembered,” Ann Tompkins says. Toward that end, here are letters from the 58th box in the attic. Received your letter some time back. Sorry Clint wasn’t feeling well. Hope he is better. He is a nice fellow. I am sending you one of the little art books. I don’t like to give it to anyone, but you understand. That stupid art critic, who has never seen my variety of work, such as portraits, Sierras, California missions, trees and deserts, has to make the statement that I am not as good as Grant Wood. Of course, dead artists get a better break. They hate to give live artists too much advertising. However he selected me. Many of the greatest paintings have been belittled by stupid critics, and now they hang in the world’s greatest galleries. I believe in my heart that your Eucalyptus painting will be outstanding, after we are gone. The “Blue Boy” and “Pinkie” were purchased by Huntington (now in the Huntington library) for a million and a half dollars. But the artists who painted them, received very little recognition at the time. I have pleased thousands of people all over the U.S. Murphy of the Supreme Court, had one of mine hanging in his office before he died. I have many “big shots” who have written me, how they like my paintings. We hope that you nice people are all well. After we left you, we went to Santa Barbara, where I had a heart attack and spent most of my time in the med. clinic there. Consequently, we cancelled our High Sierra trip. Am taking it easy now. I sure like to play cribbage with you Roy. You are such a good sport. The enclosed letters to a newspaper will interest you Roy. No one can please everybody. Box 593 – Palm Springs, Calif. The enclosed article shows what a racket modern has become – but not to intelligent people. Henry Clive, one of the foremost artists, who was on the Hearst Syndicate for 35 years – visited me and gave me this article. It is “snob appeal” . Some people think they are smarter in art appreciation and feel superior buying modern art. But it can’t live – My work will outlast all this modern junk. I suppose you are making good progress at Yermo. We’ll see you some time this summer. I’ll drop a card first so as to be sure to catch you in. I am still busy. Have to go to El Centro tomorrow to deliver a painting. When you are in town, show this Picasso article to Ruth and Ann so they know what is going on in the art world. Yesterday, Ann and Ruth and the families spent a day with us and we all had a good time. Ann brought a homemade loaf of bread, which she learned at home. The children are wonderful and Ruth’s baby — Trina — is a perfect baby. We played several games and Tillie put on the “feedbag”. Fritz took care of the baby while Ruth and I played three games of cribbage. Darn it, I won the first two — cards just came my way. But the third game Ruth skunked me. I was glad as a skunk counts two games, that made us even. Ruth is a good sport. Some time this summer we will visit them. We hope that things are going good with you and that we see you soon. After we close here in early June, we’ll drop over and see you. I have been keeping quite busy and made some good sales – one for $750 (large painting). But as I spent on this gallery, with the rent over 4,000 dollars, I needed a few good sales. Tillie & I think you have done a swell job with your children. I don’t want to bore you but you are good friends and I think you can take it. Gen. Eisenhower, with his friend, came in again Wednesday the 3rd and stayed two hours. I gave a demonstration in painting and “Ike” enjoyed it. To have him come back a second time means something from a great man like he. Now you see, you and the Bredts and many others weren’t so far wrong to buy my paintings anyway. It makes me work harder and try and become better. We all love appreciation for our efforts. Received your nice letter and always make me feel good, from real people. I will never forget how you and your kids scraped up the money when you bought that large painting. I felt sort of guilty. If any one had ever told me that I would give a lesson in painting to one of our Presidents of the U. S. I would have thought them plain nuts. The last time he was in, he watched me two hours and I explained. I was nervous at first, but he was so gracious, so I relaxed and went to town and give it all I had. I know that you are busy, so you don’t have to answer this. We’ll probably see you soon. 1107 De La Vina St. Santa Barbara, Calif. Here we are in Santa Barbara and having a fine time. Have several good friends here. I am painting sycamore trees in Oak Park. Also in the vicinity of S.B. am striving hard to get more of nature’s secrets. It has billions and in my short life I can only try and get all I can. Hope you are both fine. We leave here around the 24th of July – to San Francisco and then to the mountains, trying have NATURE tell me some more. There is no end. We hope that the kids are all well and happy. I wrote a card to Ann and Clint and thanked them for the photos she sent of the children. Maybe they are wrong or maybe they are smart. and my whole career would be the bunk. And not just drift along and be a “jerk”. For some people it is worth putting on a good show. And earn my living at the sweat of my brow. Forgive me for this lousy poetry. Just received the Life Magazine and thanks. I know Andrew Wyeth’s work. His father was a noted American artist and the son gets a break. Art is quite a business, and sometimes a racket. Of course, Wyeths have a different style and some are very good. We need a variety. Needless to say he get much more than I do. It helps a lot to have a noted father. Publicity is a great thing. Prices do not make a painting. Even the few good artists we have in this vicinity charge much more than I do — and they can’t do my work. It does not bother me. I just carry on my way and I have my work in some of the finest homes in America (and in some foreign countries). According to history, after the artist is gone, some climb to a great height in price. I am eating every day and smoke good cigars, so I am not concerned about the future. My 2000 letters prove I have real Americans who love my work, rich and poor. The working man always gets a much better price. I will always stay humble and try every day to improve my art. I wrote you a letter when we arrived home, telling you what a good time we had with you and enjoying that homemade bread and delicious cheesecake. Tillie and I took our mile walk and it was pitch dark. A big boy on a bicycle, with no lights, (so we had no warning) going over 30 miles an hour, missed Tillie and got me. I heard police siren and a cop got me up and offered to help with anything — swell guy. X-rays showed a broken collarbone and other internal troubles plus having external cuts. An orthopaedic doctor put a sort of straight jacket on me, to keep bones in place. I was struck so hard that I went right down – thank god I had the presence of mind to pull my head back before contacting the pavement or I would have had a fractured skull. My head did hurt much but breaking the fall saved me. We had several engagements but cancelled them. One, an attorney, at La Puente, great friend of mine and fine people. He bought years ago two very large paintings for Mt. San Antonio College, near Pomona. Now whether I like it or not, I have to rest. There are two sayings – “You can’t keep a good man down” or “The bigger they are the harder they fall.” The next morning it was on the local news, so we received personal and telephone calls. We do have friends who want me to stick around. I rarely complain about my troubles but is so unusual that I thought you would be interested. I can’t do much now. I wish Roy Hubbell was here for cribbage. Wouldn’t that be “lucky”? Tillie couldn’t sleep the first night but I slept pretty good, only when turning over it hurts like hell. Doctor told us to keep my arm in a sling to avoid the pulling pressure. Oh well, I guess things can’t always run smooth. But I have many paintings to make yet. I haven’t painted my best pictures yet. I have to keep this “straight jacket” on for 31/2 weeks. That time will pass so I should be ok.
Take good care of yourselves and don’t do much walking on dark nights. glad that my right side and arm are alright. The 8th and 9th will be fine to come here. It will give them plenty of time to repair the roads damaged by the 8 day rain we had. I had a few copies made for record, in case anything happens to the one Ike sent to us. I don’t pass these around to anyone. I did give one to Ethel Haywood, the right hand to the postmaster here, as she types my letters to Eisenhower and is much interested. And now one to Marie and Roy. I have never commercialized on Eisenhower’s name. Several years ago I could have had an article in the local paper and Riverside. But I did not. It might get to him. I think he knows that, as he surely is courteous to me. Of course, I don’t expect him to chum around with a dumb artist. He calls me Paul, but I say General Eisenhower. I know my place. I am and always will be a working man. I have seen many snobs and so much sham. We like real people who don’t put on dog. I love my work and as long as I can hold a brush in my hand and can see I will do my very best in the art of painting. Michelangelo is my idol. I read in the 38 dollar book I bought that he would rather be with working men in the Carrrara mines, where he selected the marble for his sculpture. I better stop raving now and go to work. 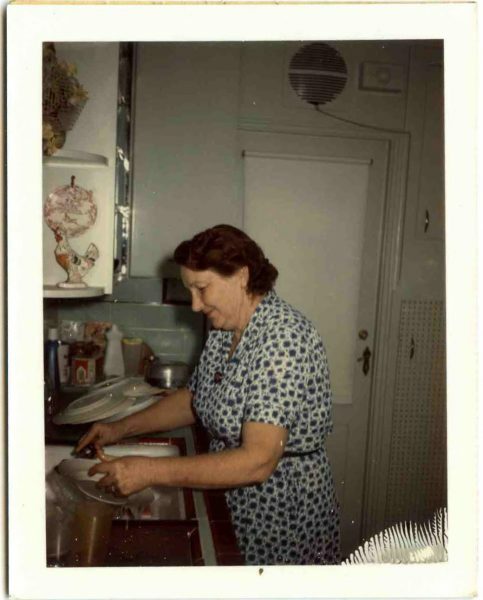 Tillie Grimm in the kitchen of her Palm Springs home. We feel bad about the news you gave over the phone. But we should not give up hope. We have seen many marvelous cures of various serious ills. Roy had a rugged constitution and that is much in his favor. Marie, you are a brave woman as well as intelligent. We know it’s tough. We feel much for you, Ann and Ruth. But time can bring better news. PS–This is not important now and I am not complaining of my younger days. My father was a fine man and often pinch hit for the Minister and preached sermons in the Baptist church. He became sick and was in bed for 13 years. My younger brother was too young to help much and my older brother Capt. Charles trained 400 men in San Diego and then to France in the war. He, as well as many more, paid the supreme price for our freedom. So it was up to me. Over 50 years ago and I didn’t make much money with art, but I managed to help. For a long time I would buy 6 doughnuts for 5 cents. 3 doughnuts and a glass of water was my breakfast. But every week I sent money home. My mother was an angel. I never complained about this. Things improved and the world’s been good to me since. We know so many people have, at some time, a cross to bear. And you are bearing it now. But we know you are brave and that better news will come. For a week I’ve started letters to you but wasn’t satisfied. I did not know what to write. I didn’t want to say anything that Roy shouldn’t know, as he might have read it. Anyway, the Hughes called this morning and gave us the news. After Tillie told me, I just stood there — I went out to the patio where I do some painting, and looked at a few of my paintings and said to myself “what’s the use” and cried like a baby. I am not ashamed of crying. I’ve seen big men cry on sad occasions. Tillie and I want to express our very deepest sympathy to all of the Hubbell family. We were always optimistic and hoping for that miracle to happen, as we have seen in many cases. Tues the 12th a couple took us in their car to L.A. to see the new art gallery where we saw fine masterpieces. We couldn’t stop in as we passed through 1000 Oaks, as they had her 90 year old father along. Next week, between the 18th and 23rd we will run down and spend the day with you. We’ll stay in a motel and go back the next morning. I will take you all to dinner, which will be my pleasure, or rather our pleasure. We are sure glad that we visited you in June and saw Roy. He was cheerful and it looked very hopeful to us. However it wasn’t to be. There is one consolation for all of us. Roy was one of the finest men we have ever met. And intelligent too. When my mother and brother Capt. Chas died not far apart, I naturally took it hard. Roy was like a brother to me. And having known him, helps to make us all better people. Tillie will call you and tell what day we’ll come to Thousand Oaks. With our love to you and the Hubbell Family. We have lost one of our best friends – Roy Hubbell. A real He-man and a gentlemen and loved by all. But a sweet memory remains. Your mother and Ruth, as well as two darling little girls drove up here to Santa Barbara to see us and we had a good talk. Marie is a brave woman. She has had it. Years ago my mother died and soon after my brother, Capt. Chas of the Marines paid the supreme price in the 1st war. Those were hard to take. Not since have I taken anything as hard as Roy’s passing. As the old stage saying goes, “The show must go on”, so we all carry on as Roy would want it. It is good that Ruth is not too far away. Marie said that Fritz is wonderful. Ruth’s two youngest daughters are wholesome little girls. Ruth showed us some photos–one of Fern, now a young lady. I remember when you were with us in Beaumont, little Fern wouldn’t have anything to do with an “old walrus” like me and I didn’t blame her. But like all children, they gradually come around and she was a pal. I lifted her up in the air, not quite to the ceiling. She enjoyed it. I love kids. Now Fern is a young lady and I wouldn’t dare to try and lift that high. I might drop dead. You know I am getting older. But I do keep active. We hope that you and family are all well and also hope to see you again later some time. We were glad to see you again and are glad that you are holding your own. You are very efficient and a good sport. We are going along as usual. I still enjoy my work and always try and improve. There is much to learn and I am doing my best and capture all of nature’s secrets. There are many hidden things which I try to get. We sure enjoyed your recent visit. You are always a sight for sore eyes. Wishing everything the best for you. You deserve it. Ann: Thank you for providing a small window into the life and friendships of Paul Grimm – a man who obviously loved his art and nature and was always looking to grow and improve. 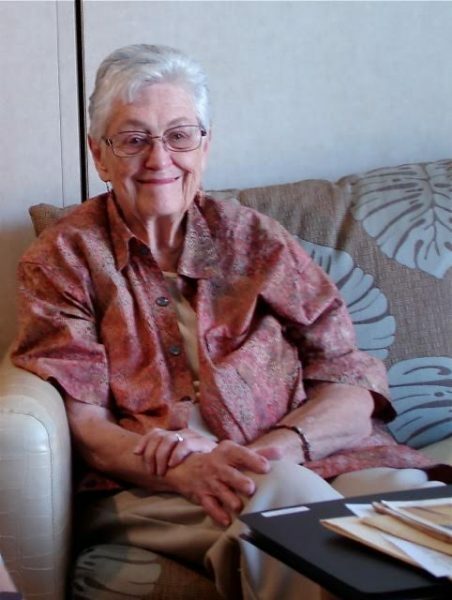 thank you for sharing, dear ann….our lives and how we share them, these days, do not compare….i love how paul grimm loved his wife and his dog! Very nice, Ann. A glimpse into the heart of a landscape painter; dedication, frustration and all. Thank you Mrs. Tompkins, your grandson and to you, Ann. Extraordinary, reading the lovely words of a most impressive gentleman. Awesome Ann. As usual.Thank you.. If you want to know more about Tillie (Thekla) Grimm, whose maiden name was Thekla Adler from Staunton, Illinois, there are still a niece and nephew and other relatives living in Staunton. Her own life was very mysterious to the family. She cut most ties to those who loved her, retaining a lasting friendship with only one cousin, Linda Menke Makler who lived to be 101. Thanks for your note, Hulda. I’d certainly like to hear more about Tillie from the relatives in Staunton, and will be in touch.